Do you live in or around Lafayette, IN and looking for services for your vehicle? Guaranteed Automotive & Transmission Service is a leading car repair shop and has highly qualified ASE-Certified auto mechanics who are ready, willing, and able to offer expert help. Once our team identifies any problems, we advise clients on a plan of action clearly and don't try to persuade them to spend money on car repairs that are not needed at the time. We’re dedicated to running our business ethically and honestly, which is why some of our clients have been with us since we opened our doors in 1983. Our services are quick and seamless at Guaranteed Automotive & Transmission Service in Lafayette, IN. Our team of auto mechanics and service advisors is committed to providing a car repair experience that is free and clear of some of the hassles and unpleasantness that you might have experienced at other auto repair shops. As soon as you drive into our facilities, you’ll see immediately why car owners choose us as their go-to choice for service and repair. “Every employee I have spoken with has been kind and patient which makes all the difference. They have been very timely with service and worked with me being a resident in Indianapolis. The level of service I have received has been spectacular! My father is also in the repair business in Tennessee, and he had been the only trusted person with my car. Very pleased to now have a trusted shop more nearby with Guaranteed Automotive & Transmission Service.”-- April W.
When drivers in and around Lafayette, IN are in need of first-rate services, they pick Guaranteed Automotive & Transmission Service. While our highly-skilled ASE-Certified auto mechanics work on car repairs, you can have some peace of mind knowing that your automobile is in the hands of a team that you can trust. For qualified services , call us , schedule an appointment online , or come by. 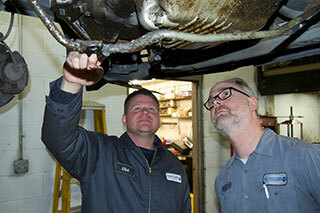 Guaranteed Automotive & Transmission Service is located at 3742 State Rd 38 East Lafayette, IN 47905.